Written by Chris Humphrey. Photos by Julie Vola. 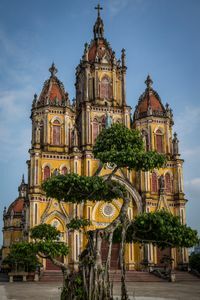 Though they receive more attention, the cathedrals of Hanoi and Saigon pale in comparison to those found in Nam Dinh Province. What’s more, the area not only boasts a surprising array of these magnificent architectural specimens, but also a plethora of striking basilicas. 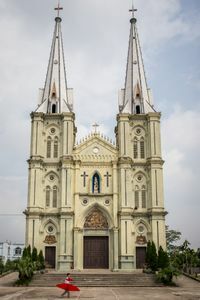 Nam Dinh has long been a major center for the Roman Catholic church of Vietnam. Heavily influenced by Spanish and French Gothic architecture, some of the province’s cathedrals appear surreal when dotted among rice paddies and roaming buffaloes. The following images reveal these buildings in their quotidian realities: farmers sweep up dried crops, children play football or fly red kites, and old men shake out the aches from their bones on morning walks. Some are newly built and defined by their splendor. 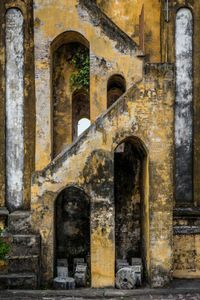 Others are ancient and crumbling. One, known as the Heart Church, is located right beside a beach. With each passing day, the now-abandoned structure moves closer towards the embrace of the waves. Today, its skeleton serves as a stark reminder of the impermanence of humanity compared to nature.